Maghreb Blog: O Maghreb: Where Art Thou in US Foreign Policy? O Maghreb: Where Art Thou in US Foreign Policy? The Maghreb has long been a region forgotten, and detached from the rest of Middle East in US foreign policy making. 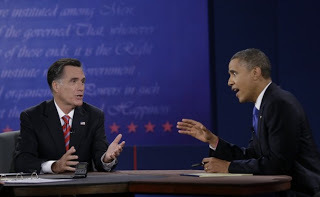 The closest we came to hearing about the Maghreb or Sahel regions, albeit in passing, was during the third presidential debate between Romney and Obama. Recent events in the past few months have made it a necessity for the US to integrate the region in its regional assessment. The ever-changing nature of state-society relations in the region in the context of the Arab revolt; and the increasing threat of extremist Islamist influence in the southern borders of the Maghreb along the Sahel region, are two crucial strategic concerns for the US. The political challenges facing the Maghreb region reflect the current Arab plight of the persistence of authoritarianism, economic backwardness and the rise of radical Islamism. Each of the five countries of the Maghreb (Morocco, Algeria, Tunisia, Libya and Mauritania) feature a set of authoritarian challenges that have to be incorporated in a general “Democracy Agenda” that the US has to pursue now, more than ever in the context of the Arab street movement for change. A cursory look at each of the Maghreb states reveals tremendous challenges for US foreign policy making. Algeria is beset by an autocratic state dominated by the military, state security services, and rampant corrupt clientelistic political elite. Although the regime has survived the civil strife of the 1990s, the state never fully addressed the causes behind the Islamist insurgency, namely the prevalence of patrimonial practices and the lack of political accountability. The state in Algeria also tightened its control of political contestation as it banned the Islamist group the Islamist Salvation Front (FIS) and has curtailed the space for political participation for other opposition parties. Morocco, like Algeria, features the same strategies of state political manipulation and stagnant reform agenda. State strategies have resulted in the relative ineffectiveness of proposed political reforms and the weakening of the major political opposition groups in the kingdom. The two main Islamist movements of Justice and Development (PJD) and Justice and Charity share a highly popular agenda of social, political and economic reforms. Despite the PJD electoral success in last November’s elections, it has since morphed into a loyal palace party functioning at the whim of the king’s vast executive prerogatives. Gone are the days where the PJD, formerly the largest Islamist opposition party in the Moroccan parliament, pursued a policy of political dissent seeking governmental accountability and transparency. The passage of the new constitution did little to guarantee a steady movement towards democratic progress in Morocco. The space for freedom of expression and the press in the kingdom is ever so limited, as various journalists are driven to bankruptcy or to flee the country from legal prosecution. Moreover, peaceful activists of the Feb. 20 movement are facing the brunt of state repression. In the past few weeks, several key members of the movement have been arrested and handed draconian prison sentences. While Morocco and Algeria still languish under the yoke authoritarian rule, Tunisia, Libya has each in differing ways toppled their despots, but still face important challenges. The announcement of the general elections in Tunisia next June will certainly be a test for the consolidation of peaceful contestation of power. The last few months have seen a stark division between the Islamist camp led by the ruling government of Ennahda, and the secularists led by the ceremonial president Moncef Marzouki. Tunisia’s predicament lies in the ability of Ennahda to tame, or perhaps distance itself from Salafi groups that long for a return to strict Islamic laws in politics and society. A year after the historical elections in Tunisia, the Ennahda-led government’s record is mixed. A recent Amnesty International report decried the failure of the government to “fully outlaw discrimination against women,” the disproportionate, “unnecessary and excessive force” used by security forces, and the lack of a fully functional and independent judiciary. The report came amid fervent protests after the death of opposition politician Lotfi Nakdh in clashes between pro-and anti-government supporters. Libya is perhaps more of concern as the central government in Tripoli has little influence over the rest of the country. The murder of US Ambassador crystallizes the creeping lawlessness in Libya. With the tribes of Bani Walid still in revolt, and the general lack of security, Libya’s path towards political and societal progress may still be a function of the ability of state to extend its central control. Toppling Qaddafi has come at a dire cost for the region. Spillover arms and ammunitions have found their way to northern Mail where “al-Qaedist” Movement for Oneness and Jihad in West Africa (MOJWA) and Ansar ad-Dine have taken effective control of the area and imposed stricter interpretation of Shari’a law. Finally, Mauritania is firmly under the control of a military junta, which staged two coups since 2005. The second putsch of August 6th, 2008 put a stop to the promising civilian presidency of Sidi Ould Cheikh Abdallahi. Elected through fair and free elections, Abdallahi showed deep commitment to democratic reforms. Soon his ambitions would clash with the military that toppled Abdallahi amidst economic hardship and increasing social unrest. Needless to say, the future of political reforms in the country is ambiguous at this point, amidst the “accidental” shooting of its current strong man Mohamed Ould Abdel Aziz. Given the current political climate, US foreign policy needs to address the political challenges facing the Maghreb region, in the contest of a vibrant “freedom agenda” that would promote meaningful reforms. The new U.S. administration needs to further press for good governance, rule of law and accountability in order to increase the scope of individual and group liberties. The relevance of the region to US foreign policy is intrinsically linked to a successful resolution of the Western Sahara conflict, which continues to stand as an albatross for regional cooperation. Furthermore, The region cannot be ignored by the International community especially within the context of the threat of terrorism in the Maghreb and the Sahel regions. Terrorist acts have increased in the Maghreb generally since 9/11, but especially after the collapses of Qaddafi’s regime and Malian central governmental control over the north of the country. The US has thus far exerted no urgency in the Maghreb or Sahel regions as Iran’s nuclear ambitions continues to be the cause célèbre for US foreign policy. It is incumbent upon the U.S. to logistically assist the countries in the region in combatting the threat of radical militant Islamism. Joint US-Maghrebi exercises on counter-terrorism tactics could greatly help reduce or neutralize the threat of al-Qaeda-affiliated groups in the region. Economically, the U.S. should also seek engagement of the region through a broader Maghreb-US-EU partnership that would further economic growth and political reforms.